The products we write about are recommended by our editorial team. Hunker may earn compensation through affiliate links in this story. 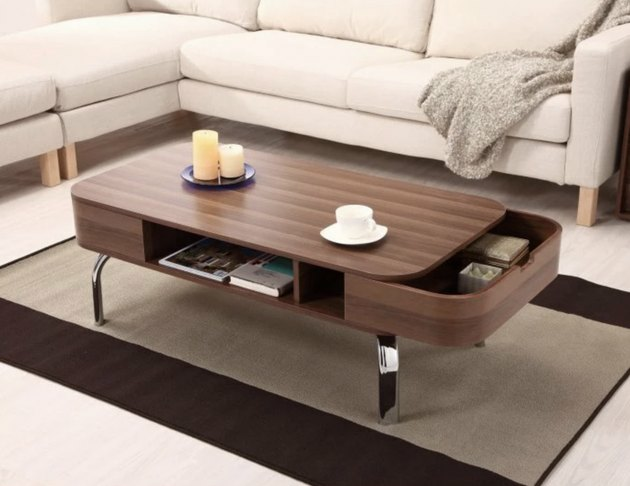 A great coffee table has to hold all the items you readily need at hand — i.e. your laptop, phone, remotes, books, and candles — and serve as a casual spot to gather around with friends and family over food and drinks. But, finding one that is affordable and doesn't sacrifice style or function can be a challenge. 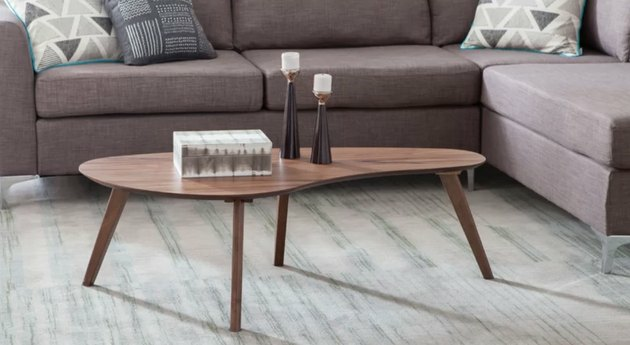 Here are 14 standout coffee tables under $200 that will get you all the compliments. 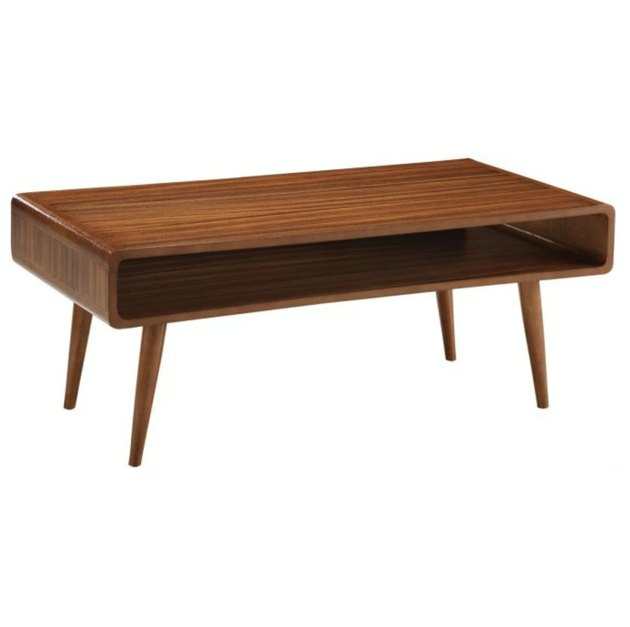 Stylish and convenient, this sleek midcentury modern coffee table has a rich walnut finish and an open-style concept that offers tons of storage space for remotes, coasters, and decorative books. 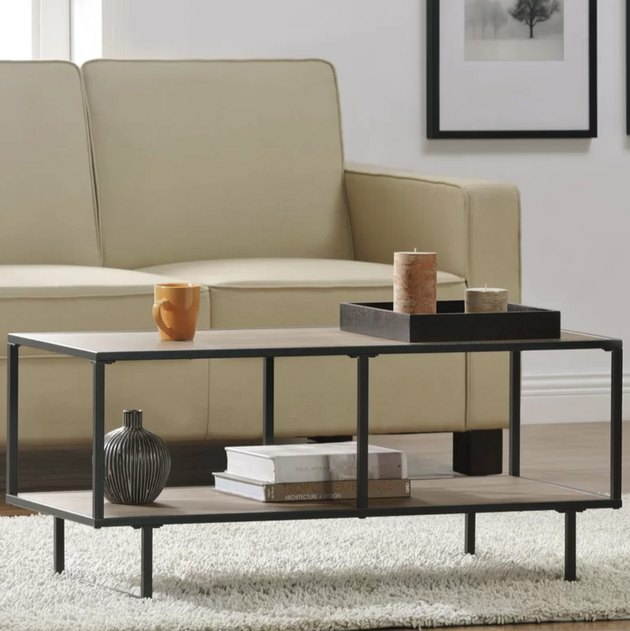 This under-$50 option brings sophistication and organization to your living room. The drop-down door has two compartments, perfect for neatly stowing away your essentials. Bonus: It comes in a walnut or solid black finish to seamlessly fit into your space. 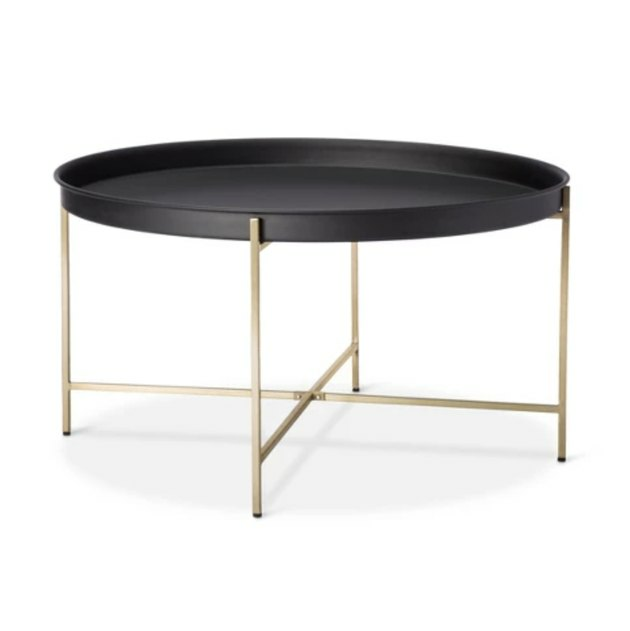 The gold and black hues of this modern coffee table are a lovely contrast to each other, while the lipped tray prevents anything from falling off. Top with a floral arrangement and layer two rugs underneath to complete the look. If industrial is more your style, this coffee table checks all the boxes. The clean-lined frame is crafted from metal with a gunmetal gray finish, while the tabletop and lower shelf are made from manufactured wood. Use it as an anchor in the center of your living room or as a media console. Tubular metal legs and a white oval top ensure that this chic two-toned coffee table is the star of any room. We love it for holding your laptop and a cup of coffee, or as a cocktail table for entertaining friends. Midcentury style at an affordable price-point? We're sold. 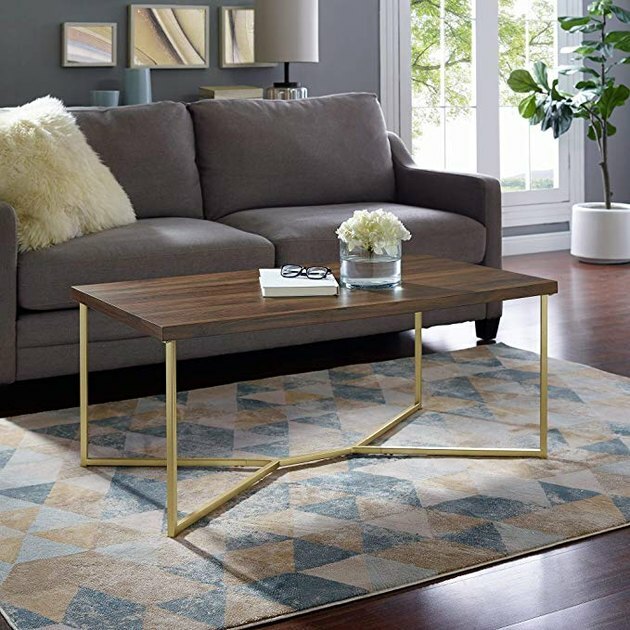 The elegant Y-leg gold metal base pairs beautifully with the dark walnut top, adding a glam addition to your living area. Functional and stylish — what more could you want? 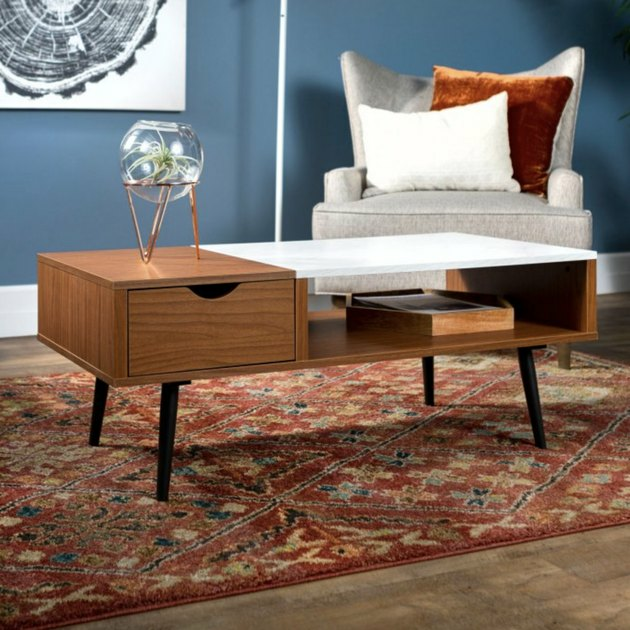 This stunning midcentury modern coffee table has a faux marble top and durable wood base (pick from an acorn or walnut finish) that will go with any décor. Also great? It has a bottom shelf and drawer for additional storage. 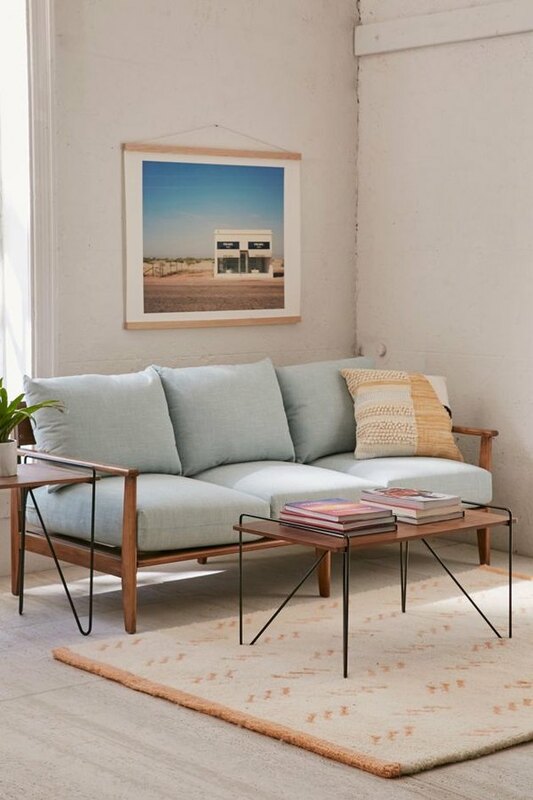 We love this simple, modern coffee table made of birch wood with walnut veneer and metal hairpin legs. Plus, it fits well in any space, small city apartments included. Show us a more gorgeous coffee table — we'll wait. 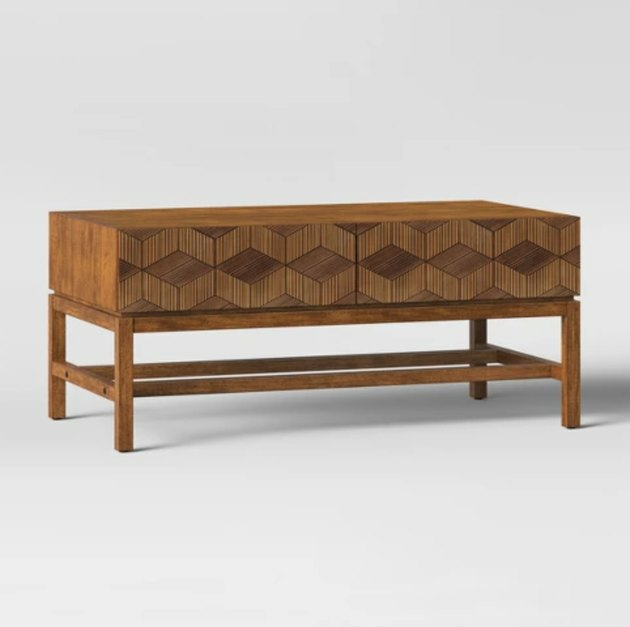 The unique geometric pattern and global design make it a truly eye-catching piece, and at a price this good, it's a total no brainer. 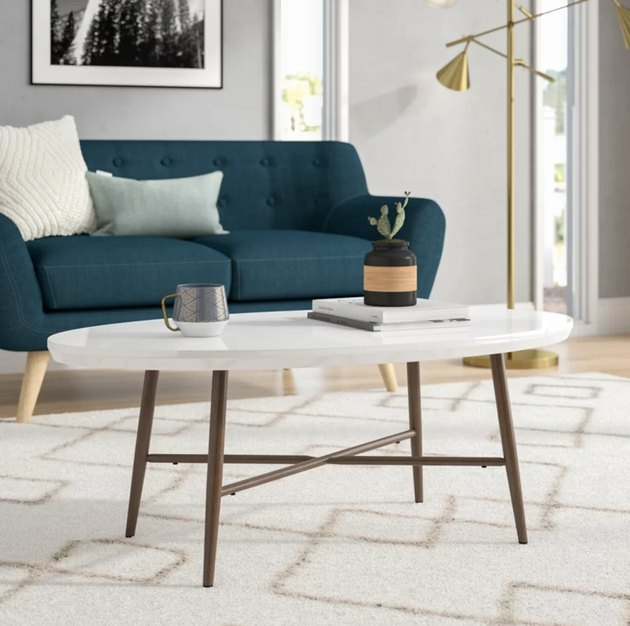 The abstract-shaped top and flared legs on this mid-century modern coffee table are very on-trend, while the neutral stain helps it blend with a variety of color palettes. Everyone will be asking where you got it! 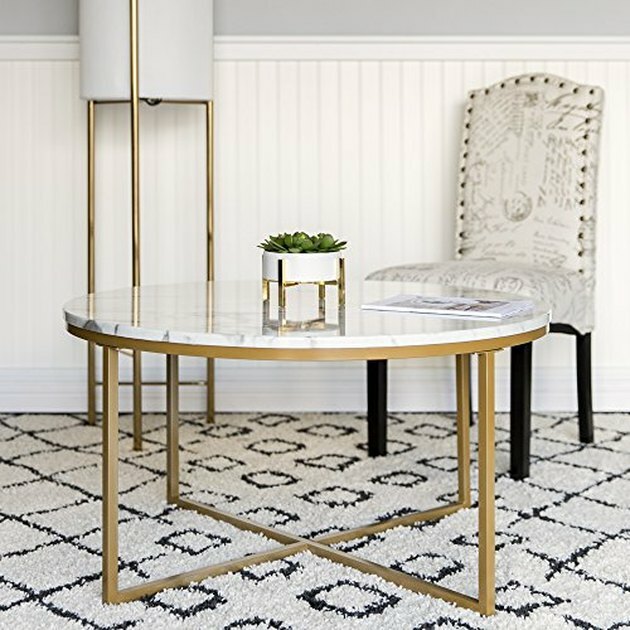 This decorative round coffee table has a smooth metal frame and luxurious marble table top. No one will ever know it's faux. Pair it with a neutral Moroccan rug and you're ready to host book club. 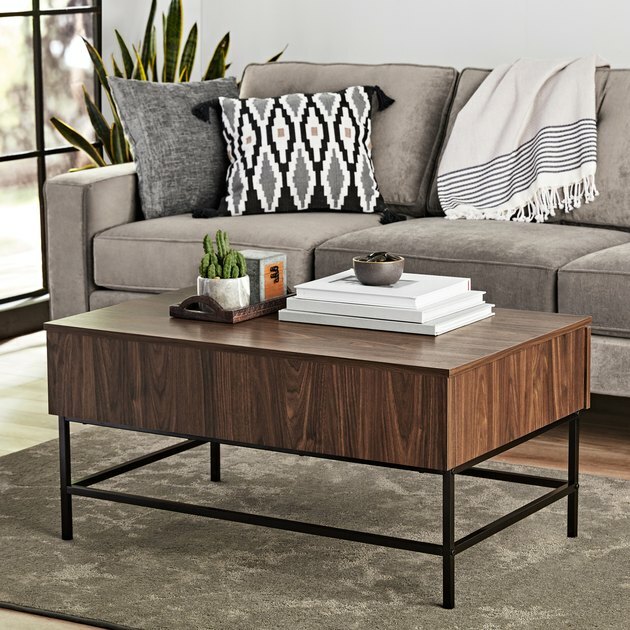 Boasting no-rust chrome legs, durable wood, warp-resistant veneers, smooth lines, and plenty of storage, this chic coffee table is worth every penny. The concealed drawers and central open shelf are a great spot for books, magazines, games, and remotes. 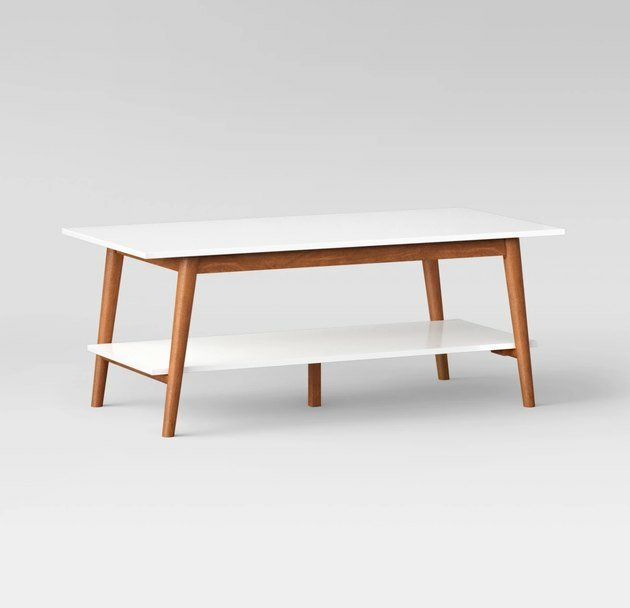 We're a little obsessed with this two-toned midcentury modern coffee table. The lower shelf is perfect for housing books, while the top surface showcases your decorative pieces or a potted plant. Looking to add storage and style to a compact living space? 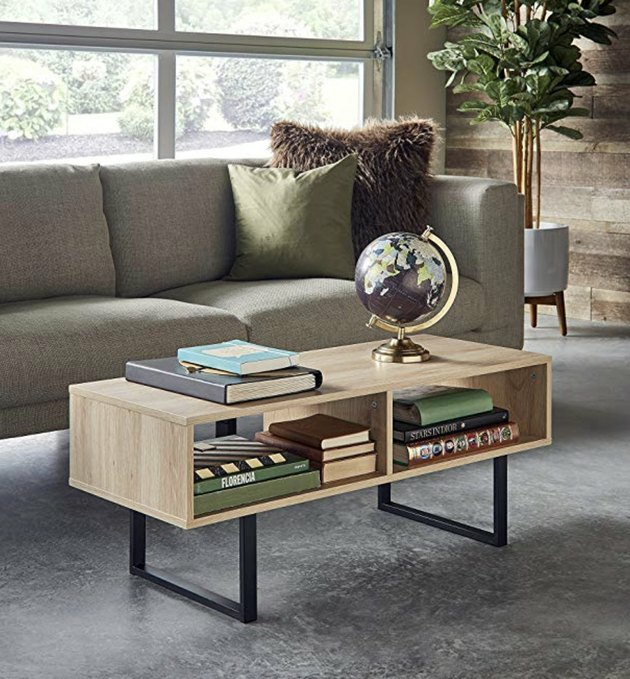 Leave it to Amazon to nail it with this cool, functional, and affordable coffee table that won't overpower your room. Susan Brickell is a New York-based writer and editor obsessed with cozy jungalow spaces, chic athleisure, and the newest skincare trends.